The Old English Sheepdog was originally bred as a 'drover's dog' used primarily for driving sheep and cattle down the country road to market but now is primarily kept as a pet. Some Old English Sheepdogs are natural drivers, moving cattle away from the herdsman, while others are natural fetchers, bringing the cattle to the herdsman. 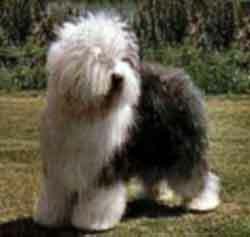 Old English Sheepdogs have shaggy fur which covers their face including their eyes. Their long coats can be any shade of gray, blue, or blue merle with optional white markings. The thick undercoat is water resistant and a good insulator in both hot and cold weather. This breed is a gentle, intelligent, funny, social, lovable teddy bear of a dog. The Old English Sheepdog loves his home and family and generally gets along well with children, dogs and visitors. As most herding breeds, Old English Sheepdogs require significant physical and mental exercise. The breed has two big requirements: grooming and exercise. If you cannot commit to both of these, you should consider a different breed. A large dog, the males weigh 70 to 90 pounds and are 21-23 inches at the withers. The slightly smaller females weigh 60 to 80 pounds and stand 20-22 inches.